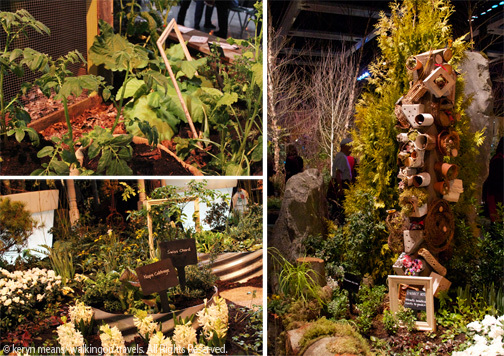 The NW Garden and Home show pops up every winter in Seattle. I was so excited to finally get to attend. I was sort of excited that Dek would get to go with me. Toddlers and massive crowds don’t always mix. My toddler in particular is prone to wandering off and joining other families if we are not doing what he wants. The good thing about going on a weekday is that you don’t have to deal with weekend crowds at least. Even better, the first morning of the show was filled with grandmas, all of whom kept an eye on wandering kids. More than one steered Dek back in my direction. Lucky for Dek he is so cute…most of the time. I tackled our outing in a very smart way. I brought a buddy with me, my friend Nic and her daughter Lee. Having two moms to tag team toddlers is always ideal at big events. I was able to take pictures; she was able to explore plants for her backyard. We both could rest easy that our kids would stay safe and hopefully not take down an exhibit. I also learned that timing is everything. We got there as soon as the show opened and entered the exhibit hall first thing. The kids were excited with loads of energy to spare. They could handle the moms ohing and ahing over some absolutely magnificent displays of landscape art for a few minutes. Nic and I took turns pointing out cool elements that would hold the kids attention and keep them from wandering off. A bird in the middle of a forest, a tiny teddy bear on a bench, a heart-shaped tulip bed and even a massive Japanese maple, anything to keep them focused for one minute more. Dek and Lee hung on for a good 45 minutes. I was so impressed. We had to move on though. We were close to meltdown mode. Time for the PlayGarden! 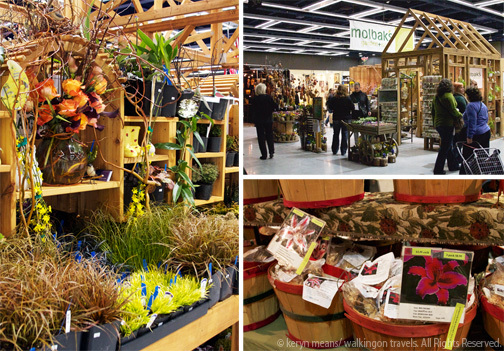 The NW Flower and Garden show is one wise organization. Let’s build a place were kids could dig in the dirt, drive cars through flower seeds and pet chickens and bunny rabbits. I’m not sure they could have scored higher points with our kids. For over an hour they explored every nook and cranny of that place. I do wish the lighting wasn’t so harsh (huge fluorescents) and there were a few more plants in the area though. Something to tie it back to the beautiful landscapes we had just seen. Dek and I also got our first taste of the performer, Casper Babypants. If you have never heard of him, he is HUGE out here. He is also Chris Bellows from the band the Presidents of the United States of America. Now all of you parents are probably shaking your head in dismay that we have never managed to see a performance, but honestly kid concerts are not top on my list of things to do and see. We have just as much fun without them. Dek proved this theory of mine when he would stop to listen for a minute, jump two times and then run off to play with the hula-hoops or tiny kitchen set. He didn’t want to dance with all the other kids. He had too much to do. I’m not saying we will never enjoy a kid concert; it just isn’t on our radar at the moment. While the kids explored the PlayGarden, Nic and I took turns keeping an eye on them. One of two marketplaces were set up just outside of the kids area luring parents to shop. I took the first run over since I had my eye on some Asiatic lily bulbs. I scoped out a few other items to purchase and then headed back to let Nic have a turn. This worked out great for us both. We could enjoy a little browsing without keeping one eye on a toddler trying to take down a glass garden sculpture. Trust me, it is easier to shop without that on your mind. Once Nic returned and the kids had a little snack we headed back into the market place to pick up a few last-minute purchases we had been pondering and then headed home. We had hopped to grab a crepe at the stand just outside the convention center, but it wasn’t in the cards that day. Dek needed a nap and Nic had to go pick her son up from preschool. We left the flower showing feeling we had tackled it the best we could. Our brains were swimming with ideas for our gardens and our noses had inhaled some of the sweet fragrances of summer. I also got to scratch one more thing off my Seattle list that I had always wanted to try when I was working. This whole stay-at-home mom thing is really growing on me. Get there as soon as the show opens at 9am to avoid some of the crowds. By noon it will be packed. Once the allure of flowers has faded in your toddler and they are falling on the floor from boredom (yes, literally) head to the PlayGarden. While your kid and buddy hang at the PlayGarden, go check out the adjacent market. Do a little shopping; pick up a new lily bulb, or ten. Don’t linger too long though. Your buddy’s turn is next and they are getting antsy. At the hand off, bring out the snacks so little tummies can hang on just a little while longer. When the naptime warning bells start to go off, make your way to the exit. Pop by any stalls for a last-minute purchase you have been pondering and then make for the door. Get the kids in the car, hand them another snack and head home. If you have time for lunch, ditch the show’s café food and head just outside to Pike Street. There is a great little crepe stand next to the Subway shop. Their latest offering is a sweet crepe featuring fig, apple and goat cheese. Yum! 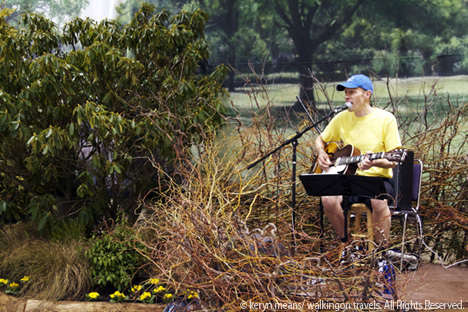 Treasure Hunt:This year each garden creator has hidden a birdhouse in his or her display. Grab a Treasure Hunt form for your child. After the are finished they will win a prize. This was created to entertain your slightly older kids as you all tour around the show, but watch out, you just might get caught up in the fun as well. Forms can be found at the PlayGarden, Display Gardens or information booths. 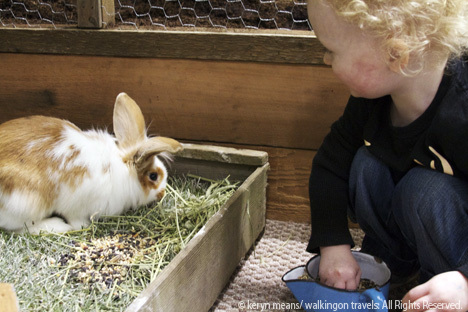 The PlayGarden: Kids of all ages will have fun digging in the dirt for carrots, sifting through bird seed, mixing up something delicious in the tiny kitchen, hopping on the bouncy balls, twirling some hula-hoops and doing crafts together as a family. 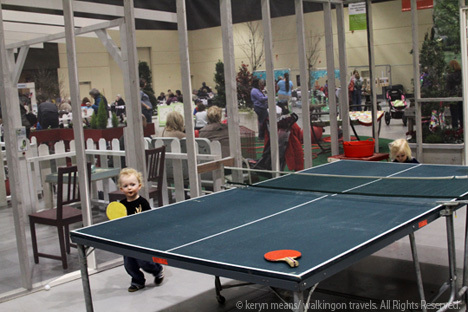 For older kids with younger siblings, there is an enclosed ping-pong table to keep them entertained. Of course little ones (and parents!) can play too. 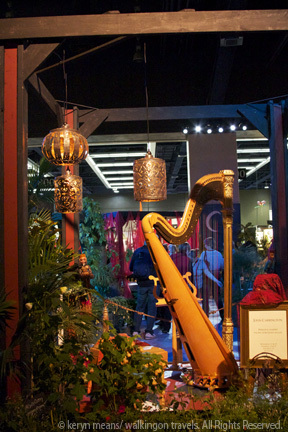 The flower show runs through Sunday, February 12th from 9am to 8pm. The show closes at 6pm on Sunday. Restrooms are very clearly marked in large letters. Look to the walls if you can’t find one, they will be there. The event staff is also extremely helpful. Just walk up to anyone with a nametag if you need directions. Give yourself at least 3 hours to fully explore the show. If you plan on attending seminars you will need to factor in more time. There are several parking garages downtown. Assume you will pay between $9-$15 to park depending on how long you will be there. Many of the city buses go straight downtown. As long as you get close to Pike Street you can walk up to the Convention Center. Don’t forget your camera! 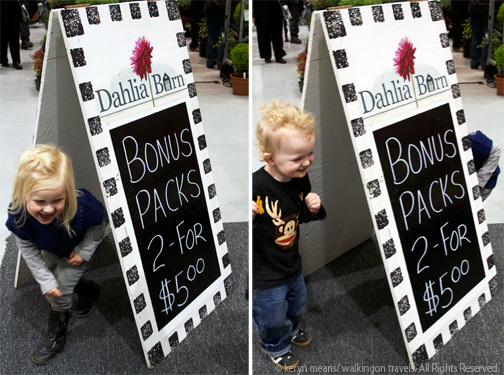 Not only will you get some great gardening ideas, but you will also capture some priceless moments with your kids. What a great idea for the organizers to put in a playgarden for the kids! 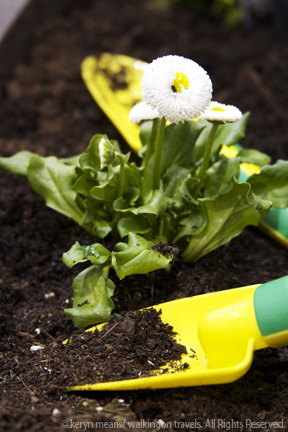 Isn’t it nice to start thinking about spring and planting flowers? It’s my favorite thing to do when I am pregnant. I can’t fit in any of the cute clothes I see so I shop for plants instead. My flowers tripled when I was pregnant with Dek. Granted we had just moved into the house but still. Home Depot and flower nurseries were not a safe place for me to go alone. What a fun activity! It may be a boy thing, but my boys never stopped to listen to child performers – my daughter on the other hand LOVES them? Thanks for linking up – love the pictures!! 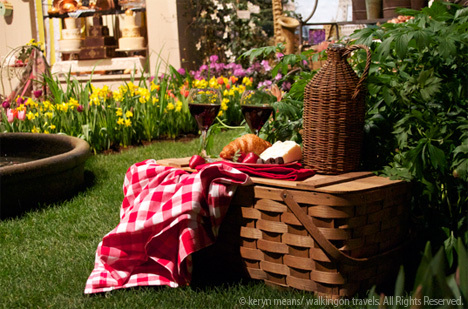 Thanks for the tips, we are probably heading to the Philadelphia flower show for the first time– I have been avoiding it because of the crowds of people.Wish us luck! I am so jealous you get to go to the Philly show! I haven’t been there since grad school. I still remember the wizard of oz garden. So amazing. I will admit I got bored quick though as my parents could wander a garden for hours (just like me now ;-), but I still have very fond memories of it and hope to get back some day. What great pictures! 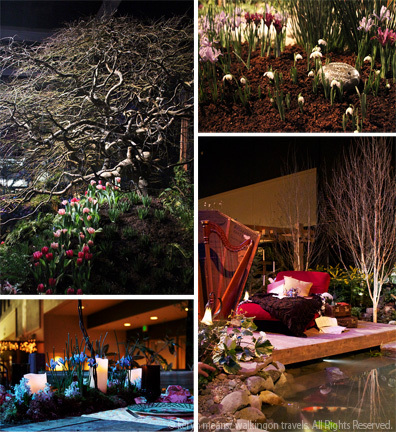 I am still kinda confused about what a flower show is all about, but I guess that means I just need to go. Love the playgarden! The bunnies were in the back left corner. Pretty hard to see with all the other stuff in the way. We were the only kids hanging out in there. So glad you had a great time! One strategy item you forgot: bring your camera! Luckily you didn’t forget yours, because that is a very photogenic place! Ha ha! You are right. My camera is like another limb so I don’t even think about suggesting that people bring one. I always have one with me. I’ll add it in right now though!